Wonderful opportunity to own a luxury townhome at MacDill City Homes located in South Tampas desirable Bayshore Beautiful neighborhood. 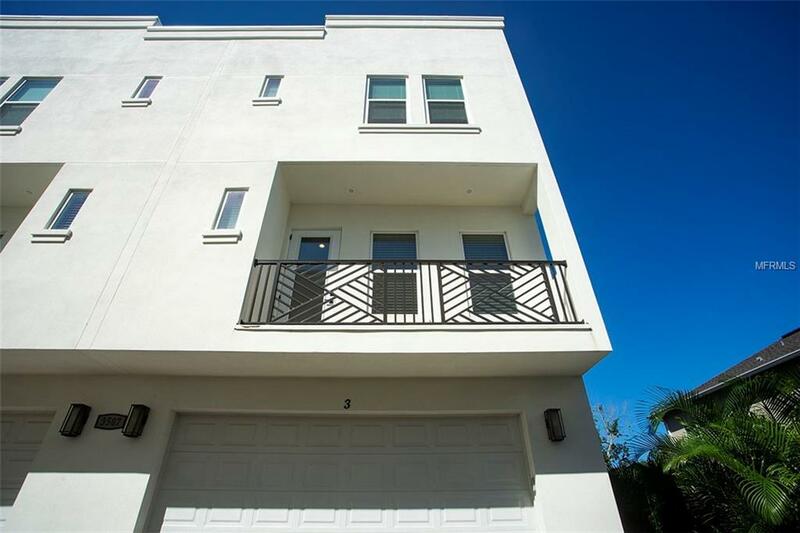 This 3 bedroom, 3.5 bathroom end unit with over 2,300 SF of living space offers contemporary design exterior with dividing concrete block wall sound barriers and insulated impact windows and doors. Exposed floor plan affords 10 ceilings, crown molding and central living area on the second floor containing wood floors and open epicurean kitchen with stainless steel appliances (gas range), plentiful 42 wood cabinets, custom backsplash and abundant stone countertops including island and bar overlooking the spacious bordering dining room. Adjoining living room with gleaming wood floors offers guest powder bath and private balcony for relaxing. Substantial third floor owners suite boasts considerable walk-in closet and en suite bath with twin vanities, garden soaking tub, private W/C and step-in glass shower. Other amenities include two additional full suites (one first floor, one third floor), multi-zone temp control with two HVAC units and two car garage. Excellent location allows quick commutes to downtown, MacDill AFB, TGH and Westshore business district as well as access to blue ribbon schools, easy drives to area entertainment and dining destinations and soothing walks to Tampas famed Bayshore Blvd. Additional Lease Restrictions Please See Hoa Rules And Regs. Pet Restrictions Please See Hoa Rules And Regs.